This Healthy Barbari Bread, a popular Persian flatbread, is a must try for those who love baking bread. Crusty outside, tender inside, super tasty and nutritious! It is also known as Nan-e Barbari or Noon Barbari. Much has been written about the famous Persian barbari bread. Long ago, I fell in love with it the very first time I had tasted it, during one of my out of town visits. But to my chagrin, I found out that this delicious bread was not available in the town where I lived. I had already been baking bread from scratch and thoroughly enjoyed it, as you can see just a few samples of my passion on this blog – my chocolate hazelnut crescent rolls and sumac chicken mini musakhan (a pizza style bread). So, then I had to learn to make it. It was a long journey, trying to self teach myself this recipe. Only for it to be further perfected under the expert eyes of my father in law, who had grown up watching street side bakers skillfully make them. And now I have successfully made this for years, so much, that I could perhaps make it in my sleep! Well, that was a stretch! But the point is – making this bread had become a habit for me. However, one thing always bothered me. 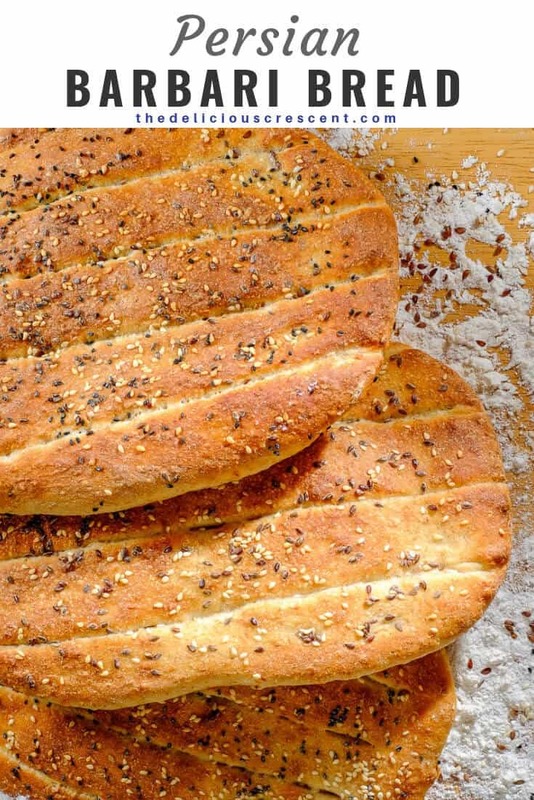 Much like French bread, barbari is typically prepared with refined flour. I wanted to prepare a healthier version of this bread, to be able to make it more often. And I tried many different approaches. 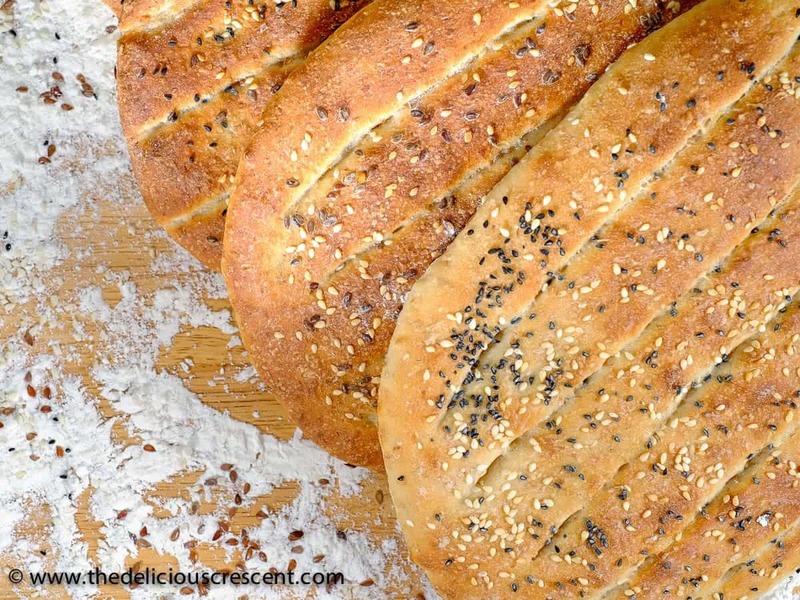 Finally, I tested this recipe for a healthy Persian barbari bread with the addition of wheat bran and flaxseed meal in various proportions and found what worked best! Adding the bran and flaxseed meal to the dough in the final stage, once the gluten network was already developed, worked very well. It resulted in a super product – both tasty and nutritious. Wheat bran and flaxseeds are great sources of dietary fiber. And flaxseeds are a rich source of omega-3 fats. Both, dietary fiber and omega-3 fats are very important for human health and have numerous benefits. Black seeds and sesame seeds along with flaxseeds, have come to be known as “Superfood” seeds. Sesame seeds are a great source of zinc, which helps immune health. They also provide protein and dietary fiber. Black seeds are an excellent source of dietary fiber; provide a good amount of protein, fat and certain minerals – calcium, magnesium, iron. These wonder seeds have been used for centuries to treat a whole host of illnesses in traditional eastern medicine. 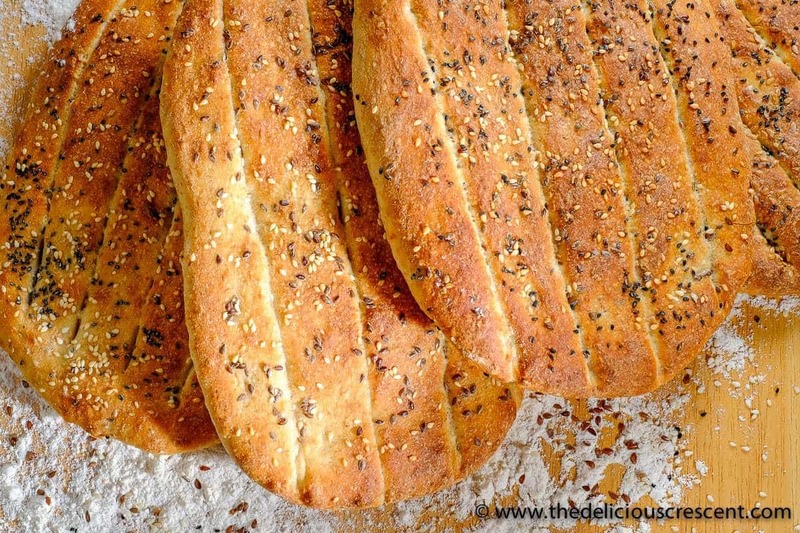 This recipe is designed to be accessible as a homemade recipe and does not go by all the traditional professional barbari bread baker’s steps. I hope that you enjoy this Barbari recipe and try making it. You may also like my zaatar and parmesan cheese bread rolls and for a sweet classic German fruit bread, try my marzipan stollen with almonds and apricots. Do you like making homemade bread? 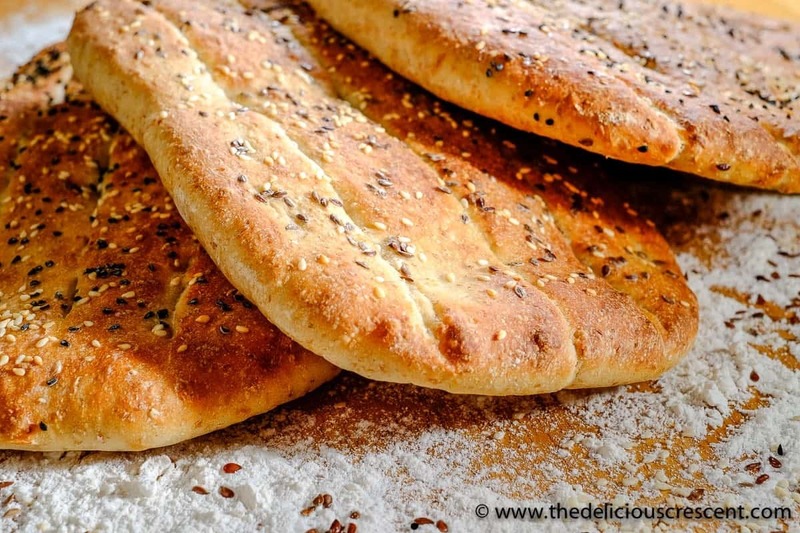 Did you try this Persian Barbari bread? 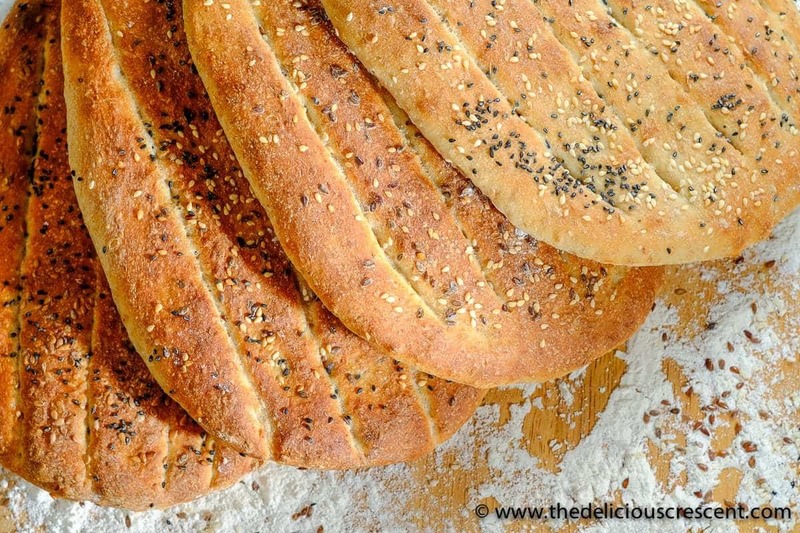 This Healthy Barbari Bread, a Persian flatbread, is a must try for those who love baking bread. Crusty outside, tender inside, super tasty and nutritious! It is also known as Nan-e Barbari or Noon Barbari. Preheat oven to 500 º F or more (I bake it at the highest possible in my oven - 550 º F). Take warm water (120 - 130 º F recommended for fast acting yeast, for active dry yeast it is 105 to 110 º F, check package instructions). Sprinkle the yeast over the water. Scatter the sugar on the top. Let it stand in a warm dark place for about 5 to 10 minutes until the yeast bubbles/foams up on the surface. Add the bread flour, salt and mix it using the dough attachment in a stand mixer, if available. Mix on low speed until just blended. The mixture will be a bit pasty/sticky. Let rest couple minutes. Then add the wheat bran and flaxseed meal, and let the machine knead at low - medium setting for about 5 minutes. If needed, add some flour, a little at a time (a tablespoon or so) to make sure that the dough is smooth, elastic and not excessively sticky. If you do not have wheat bran and flaxseed meal, just use extra bread flour. 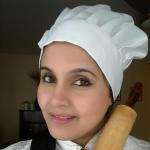 Overall it is important to not add too much flour, so take time and add the flour gradually, just as needed. It is actually ok if the dough is even a bit sticky, but it certainly should not have excess flour. The idea is for the dough to result in an airy and crusty bread. **Alternatively the dough can be made by hand too. Just make sure to knead it well for at least 5 minutes or more. Transfer dough to an oiled bowl. Cover with a lid/moist cloth. Let dough rest in a warm place (80 º F) approximately 1-2 hours (time varies with type of yeast), until double in bulk. Punch down dough by pulling the dough up on all sides, folding it over the center, pressing down, then turning over in the bowl. Divide the dough into four portions. Press dough ball by hand to force out any air bubbles. Using rolling pin or "hand" roll each ball into a nan/oval shape to an approximate size of 12 x 6 inches. Use bread flour for dusting the surface and the rolling pin as needed while shaping the loaves. With the help of the rolling pin transfer the rolled out barbari bread to parchment paper that is laid on the kitchen counter. The parchment paper is useful to transfer the loaves easily onto the baking sheet. If you are familiar with the use of a baker's peel, you may use that instead. Let the loaves rest at room temperature and allow the dough to nicely swell up (15 - 20 minutes). Brush/spray (mist) some water on the surface of the loaves. Sprinkle about one and half teaspoons of black/sesame/flax seeds. It is traditional to use black seeds and sesame seeds. Press the seeds down gently. Let rest and rise a little again. Mark deep indentations with fingers or back of a butter/table knife. Make sure the indentations are deep enough, otherwise the bread will puff up like a pita, while baking in the oven. Spray water on top if/as needed. Transfer the prepared healthy Persian barbari bread along with the parchment paper lined below onto a flat baking sheet and slide it into the oven. Bake for 8 to 10 minutes until well done. The baking time will depend on the oven. But it is best if it is baked within 8 minutes, but no more than 10 minutes. If the top has not browned well enough, but the loaves have fully baked, then you may broil the loaves on high for few seconds - as needed for browning. 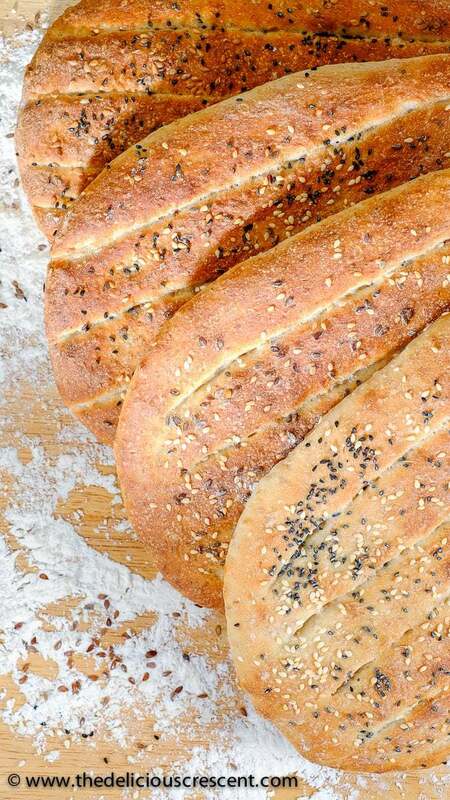 Transfer the baked healthy Persian barbari bread to a wooden board, cooling rack or lay them on thick towels. Once cooled to room temperature, save them in ziploc bags. This Healthy Persian Barbari Bread is best when it is eaten fresh, which is crusty on the outside and soft inside. But it can be saved at room temperature for couple days, depending on the local weather conditions. It can be refrigerated or frozen for later use. If it is not served fresh, then the bread should be toasted or warmed prior to serving. Ensure the use of flour to dust surfaces while working with dough, transferring to sheet pan, dusting rolling pin as needed. But not overdo it as it will dry up the dough. Make sure to cover the dough/naans while working with it to prevent drying up. Work with small quantities of dough at a time, covering the remaining dough. May use white whole wheat flour instead of bread flour, in which case you may skip using additional bran if you prefer. You may try equal parts white whole wheat and bread flour too. Using 1/4 cup of wheat bran works very well in this recipe. But you may start with 2 tablespoons, if you prefer, and may comfortably increase to 1/4 cup. 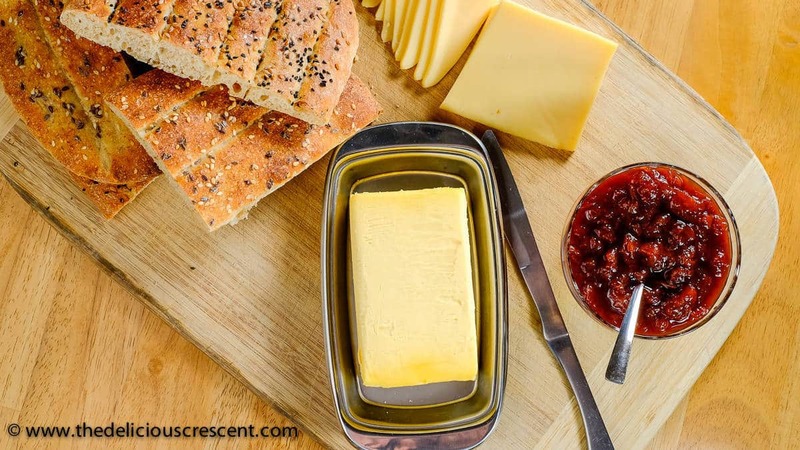 Broiling: Be careful with this step as the bread can get burnt quickly when broiled. About 10 - 30 seconds may be sufficient depending on the oven and browning needed. The high quality professional ovens will not need the use of this tip. Black seeds are well appreciated for its taste in cultures that are familiar with its use. If it is new to you, please experiment with it. I use King Arthur brand bread flour. I am iranian and I’ve missed barbari since I left my country (and to be honest as much as family:))). Thank you so much. And I am so happy to see it coming from you. Indeed it is an amazing bread. For me, even though I had the recipe, I improved on the technique with practice. So I was able to grasp what I needed to do to make it work best with my equipment. If you have any questions at all please feel free to ask and I will be so glad to share my own experience and thoughts. Thank you. Flaxseed works well in bread recipes. You should definitely try it. Start with smaller quantities and increase it as per your taste and suitability to the recipe.